Husson University women's basketball coach Kissy Walker calls out a play during a recent game at Newman Gym in Bangor. 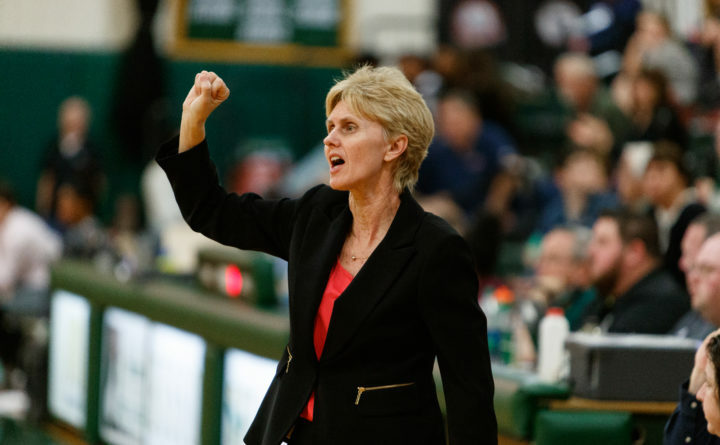 The Augusta native recently achieved her 500th career coaching victory during her 28th season leading the program. Mary “Kissy” Walker considers herself blessed. The Husson University women’s basketball coach picked up her 500th career victory Friday night by virtue of a 64-55 North Atlantic Conference triumph over SUNY Canton at Newman Gym in Bangor. No. 501 came the next day via a 49-47 victory over the Roos. Walker is among only 34 NCAA Division III women’s basketball coaches to reach 500 victories, joining the likes of Mike McDeVitt at Saint Joseph’s College in Standish (545-193), who has been a head coach for 27 seasons overall. 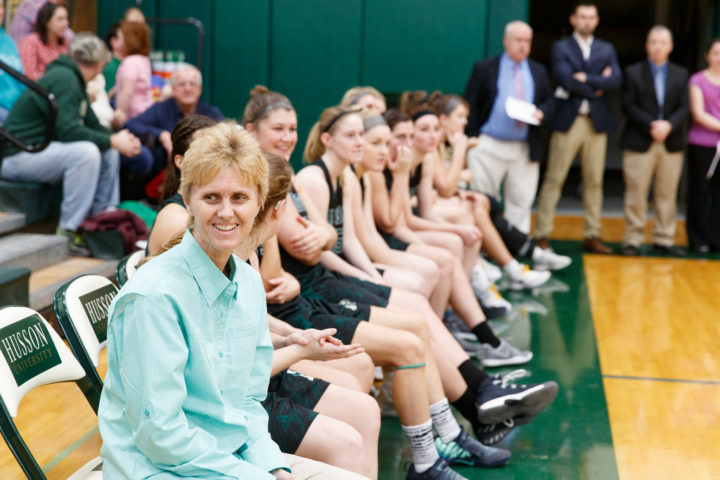 In her 28th season at Husson, Walker has compiled a record of 501-261 and has led her teams to 10 conference titles, four NAIA National tournament and six NCAA Division III tourney berths. Walker said she is fortunate to be surrounded by a special group of assistant coaches in Randy Dodge, Matt MacKenzie, Lauree Gott and Steve Waceken. “How many coaches have had assistants who were with them for over 20 years?” Walker said, referring to Dodge, who is in his 24th season at Husson. “Randy is so loyal. I get to coach with my best friend [Gott] and my nephew [MacKenzie], and Steve drives over an hour to be here [from Millinocket]. “[Former assistant] Ed Gott told me to surround yourself with good people and good things will happen,” said Walker, a former University of Maine point guard and captain who starred at Cony High School in Augusta. She said the 500 wins is more a milestone for the program than it is for her. But she is grateful for the outpouring of support and the postgame ceremony and reception. Three of the players on this season’s team are daughters of her former players: Sami Ireland is the daughter of Becky (Moholland) Ireland, Sydney Allen is Sue Ann Allen’s daughter and Kristi (Wildman) Tapley is Emma Alley’s mother. Amy (Dyer) Drinkwater was also in attendance and her daughter, Ashley Littlefield, previously played for Walker. Tapley played on Walker’s first Husson team and was on the squad that reached the NAIA Fabulous Four. “I loved playing for her. It was the best four years of my life. I made some real good friends I still stay in touch with,” Tapley said. “Kissy cares about her players. That’s the reason my other two daughters want to come here,” she added. Allen said Walker is one of the big reasons she encouraged her daughter to go to Husson. “I don’t have to worry about anything going wrong. If she needs help, Kissy is there along with the rest of her staff. It’s comforting to know they’ll take care of her,” said Allen, a former captain at Husson and a member of the Husson Sports Hall of Fame. She said Walker and her staff create a family atmosphere just like they did when she played. “They have real good chemistry. They have a lot of good kids on the team, and they have fun,” Allen said. Walker said fostering good team chemistry is a priority for her and that she recruits the kind of young women who are likely to make that happen. Sophomore center Megan Peach said during the recruiting process Walker told her she was impressed with the positive attitude she displayed even when things were not going well. “She cares about that. She has turned girls down because their personalities didn’t fit with us. We appreciate that. We don’t want to have a team with infighting,” Peach said. Senior guard and captain Kenzie Worcester of Washburn said one of the keys to Walker’s coaching success is that she is an exceptional communicator. “She really gets across [what she wants], and everybody is on board with her plan,” said Worcester, who also called her time at Husson the best four years of year life. Dodge said Walker brings out the best in her assistants because she listens to them and respects them. He stressed that awards don’t mean anything to Walker compared to providing a quality experience. “The fact she is coaching the daughters of her former players speaks volumes. They trust us with their kids and that’s huge,” Dodge said. It hasn’t always been a bed of roses for Walker. She missed two seasons in the early 2000s because she was dealing with panic attacks related to travel. “I really struggled with that. I faked it a lot. A lot of people didn’t know about it,” said Walker, who used her time off to get her master’s degree in business administration from Husson in 2003. She took medication for 21 years to combat the anxiety, but stopped taking it three years ago and is feeling well. Walker, the mother of 17-year-old Isaiah, feels she continues to improve as a coach and is better at handling adversity now. “I don’t let things get to me as much as when I was a younger coach. We have had three girls lost to knee injuries this year, and that would have really stressed me out when I was younger. But I learned you have to do the best with what you have. You just keep working harder,” Walker said. She considers the trip to the Fabulous Four and the subsequent NCAA tournament appearances to be among her career highlights, along with the first Division III tourney win over DeSales during the 2016-17 season. Walker has no plans to retire, although she admitted that the demands of recruiting and the late nights are challenging. One thing makes it all worthwhile. “I have great kids,” she said.